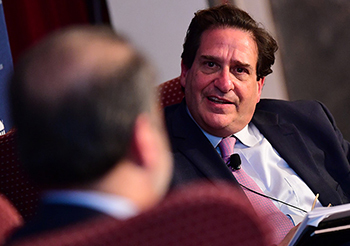 With threats to the U.S. democratic system dominating recent headlines, the topic of Dean Matthew Diller’s fireside chat with Preet Bharara at the annual meeting of the New York State Bar Association (NYSBA) on Jan. 18 was particularly timely. 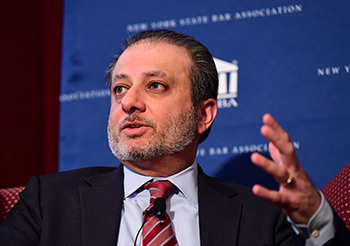 Diller and Bharara, U.S. attorney for the Southern District of New York from 2009 to 2017 and currently a distinguished scholar in residence at NYU Law, discussed recent challenges to democracy in America. 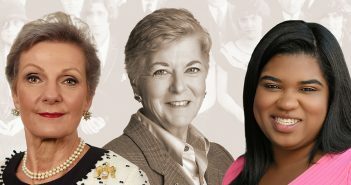 They also examined, during the 30-minute conversation, the complex relationship between social media and democracy—in particular with regard to the type of heated political debate that occurs on platforms like Twitter and Facebook—and the lessons that a democracy under fire might learn from the way a modern American courtroom operates. This last point was well taken, as Diller and Bharara conducted their conversation in front of a packed room of judges, lawyers, and other legal professionals during a lunch program organized by NYSBA’s Judicial Section at the association’s annual meeting at the New York Hilton Midtown. Diller began the discussion by mentioning Bharara’s role as co-chair of the bipartisan National Task Force on the Rule of Law and Democracy. Diller read the first sentence of the task force’s report: “The values that undergird American democracy are being tested.” From there, Diller and Bharara explored what those bedrock values are, and how one might bolster them in times of intense political polarization and uncertainty about the future. “A lot of democracy works on the honor system,” Bharara noted, stressing that a president who does not respect established norms and boundaries as his predecessors did can indeed bring the system crumbling down. “The system is only as good as the people who have a commitment to it,” Bharara said. But, he maintained, there are still many people who believe that there are ideals that come before partisanship. He listed core democratic values such as the decent treatment of fellow humans, the independence of law enforcement and of the judiciary, and the free press as examples. The effects of social media on democracy were another discussion topic, particularly the deep political divide that social media seems to foster. “How should we try to reach across this divide?” Diller asked. Indeed, Bharara believes that democratic debate has veered too far from the reasoned, structured argument and analysis of the courtroom and has become akin to the yelling matches we often see on cable news. “When you explain to people that reason, logic, evidence, and respectful disagreement have worked for hundreds of years in our system, maybe you can make people think more about the way they resolve disputes outside of the courtroom,” he said. Bharara’s new book, Doing Justice: A Prosecutor’s Thoughts on Crime, Punishment, and the Rule of Law, is scheduled for release on March 19.